As soon as Bryce Dallas Howard’s character utters the words “genetically modified hybrid,” you know things are about to go awry. 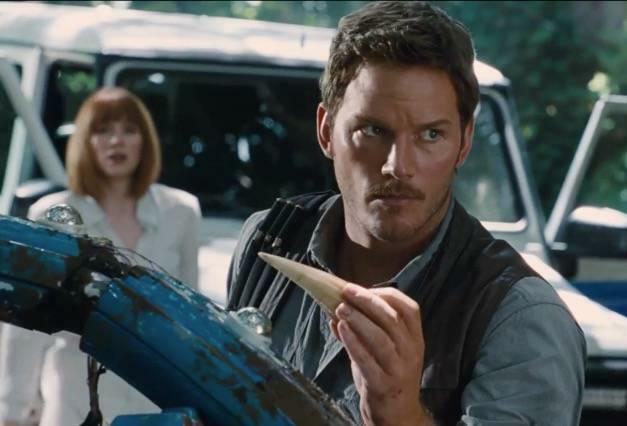 In the first full-length trailer for Jurassic World, we’re taken back to where it all started, and judging by what we see, the park first envisioned by John Hammond is thriving; it looks like every other theme park. Except, you know, the main attractions are prehistoric dinosaurs. At one point, we glimpse the ridiculousness of the whole spectacle as a crowd sit around an ocean and witnesses an immense water dino (possibly a Spinosaurus) eating a great white shark. It’s unclear what kind of dinosaurs the scientists have made in their labs, but the trailer suggests it’s big, strong and highly intelligent. Not the kind of characteristics you want in a dinosaur, particularly when it’s part of a theme park. We’ll find out real quick that man cannot control nature, just as we did in the first three Jurassic Park films. While the first half of the trailer starts out positive, we eventually see chaos, including a shot of what could be the hybrid dinosaur. The stakes are much higher this time around since the park is teaming with civilians, though it looks like much of the film will focus on a few characters in particular. I am a huge fan of the Jurassic Park franchise—yes, even the second and third movies—and I’m really excited that we’re going back to Isla Nublar. Hold on to your butts. Jurassic World his theaters on June 15, 2015.